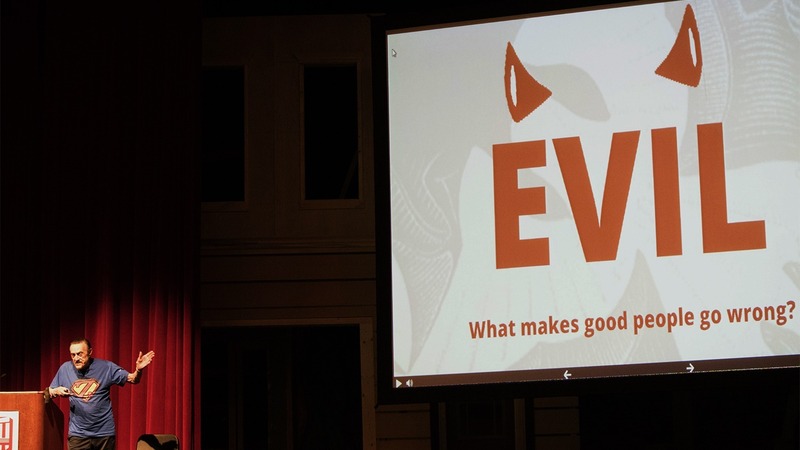 Erick Lemus/Courier Dr. Zimbardo asks what makes people evil during his presentation revolving around his life's work in the Sexson Auditorium on the PCC campus at Pasadena on Tuesday, March 21, 2017. Philip Zimbardo is a famous psychologist and professor at Stanford University. He is most famous for his Stanford prison experiment in 1971 in which he created a fake prison and a group of volunteers were separated into two groups based on their personalities. One group was made the guards and one group was made the prisoners. The experiment was supposed to go on for fourteen days but because of how extreme the circumstances had gotten, it only lasted six. Although the experiment was controversial, it helped Zimbardo realize how easy it can be for seemingly good people to turn bad, and how sometimes people can become products of the situation. He believes that everyone can be a hero just by speaking up or by taking action. That is how people don’t become products of their situation. Then once they do take action, other people will see those actions and follow suit. The introductory slide of Dr. Zimbardo’s presentation. Even though it is an easy concept to grasp, Zimbardo does acknowledge that there is one big reason why some people decide not to speak up when they notice something wrong, and that reason is shyness. Zimbardo defines shyness as a “self-imposed psychological prison” and that by being shy, you yourself are limiting your own words and actions. He believes that people become shy because they are afraid of being ridiculed by other people and also having failed in certain experiences play a part as well. According to Zimbardo there are ways to conquer your shyness. Taking social risks in your everyday life like talking to strangers, making eye contact with other people, smiling and by learning to give and take compliments all help in getting over shyness. “Tequila is also one unusual solution people use to conquer their shyness,” Zimbardo said jokingly.